A brief description of key concepts drawn from Group Treatment for Substance Abuse: A Stages-of-Change Therapy Manual, 2nd edition (Velasquez, M.M., Crouch, C., Stephens, N.S., & DiClemente, C.C., 2015), selected resources for clinicians, and other useful links are provided below. The transtheoretical model (TTM) of behavior change draws from a wide range of major psychological theories and approaches—hence “transtheoretical”— and offers a well-established and research-based framework for understanding, measuring, evaluating, and intervening in behavior change. According to the TTM, the stages of change that a person goes through when changing a behavior range from an initial “precontemplation” stage to contemplation, preparation, action, and to a “maintenance” stage in which the client works to sustain long-term change. Each stage represents important tasks that facilitate change, and progress through these stages is often cyclical rather than linear. Current work on the TTM supports the strategic use of the TTM’s experiential and behavioral processes of change for both individuals and groups, and the application of the model to numerous populations and behaviors. Connors, G. J., DiClemente, C. C., Velasquez, M. M., & Donovan, D. M. (2013). Substance abuse treatment and the stages of change: Selecting and planning interventions. (2nd ed.). New York, NY: Guilford Press. DiClemente, C. C. (2003). Addiction and change: How addictions develop and addicted people recover. New York, NY: Guilford Press. Velasquez, M. M., Ingersoll, K., Sobell, M., & Sobell, L.C. (2015). 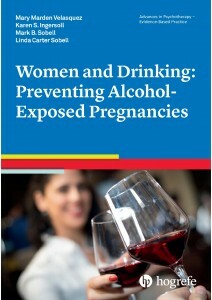 Women and Drinking: Preventing Alcohol-Exposed Pregnancies. Series: Advances in Psychotherapy – Evidence-based Practices, vol. 34. New York, NY: Hogrefe Press. Velasquez, M. M., Crouch, C., Stephens, N. S., & DiClemente, C. C. (2015). 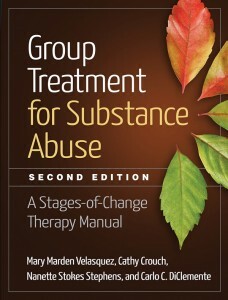 Group Treatment for Substance Abuse: A Stages-of-Change Therapy Manual. (2nd ed.) New York, NY: Guilford Press. Velasquez, M.M., Gaddy-Maurer, G., Crouch, C., & DiClemente, C.C. 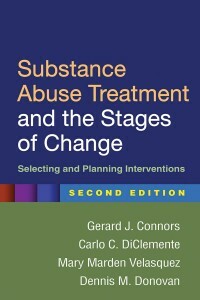 Group Treatment for Substance Abuse: A Stages of Change Therapy Manual 1st edition. New York, NY: The Guilford Press. 2001. (Published in English, Dutch, Greek, Korean, Chinese, Japanese, Portuguese and Arabic). Velasquez, M. M., von Sternberg, K., Dodrill, C., Kan., Y., & Parsons, J. (2005). The Transtheoretical Model as a framework for developing substance abuse interventions. Journal of Addictions Nursing, 16(1-2), 31-40. Heesch, K. C., Velasquez, M. M., & von Sternberg, K. (2005). Readiness for mental health treatment and for changing alcohol use in patients with comorbid psychiatric and alcohol disorders: Are they congruent? Addictive Behaviors, 30(3), 531-543. Velasquez, M. M., Carbonari, J. P., & DiClemente, C. C. (1999). Psychiatric severity and behavior change in alcoholism treatment: The relation of the transtheoretical model variables to psychiatric distress in dually diagnosed patients. Addictive Behaviors, 24(4), 481-496. Velasquez, M. M., Stephens, N., & Drenner, K. (2013). The transtheoretical model and motivational interviewing: Experiences with a cocaine treatment group. In C. C. Wagner & K. S. Ingersoll (Eds. ), Motivational interviewing in groups. New York, NY: Guilford Press. Miller, W. R., & Rollnick, S. (2013). Motivational interviewing: Helping people change. (3rd ed.) New York, NY: Guilford Press. Wagner, C.C. & Ingersoll, K. S., Eds. 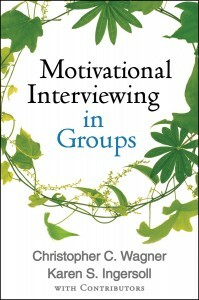 (2012), Motivational Interviewing in Groups. New York, NY: Guilford Press. DiClemente, C. C. & Velasquez, M. M. (2002). Motivational Interviewing and the Stages of Change. In W. R. Miller & S. Rollnick (Eds.) Motivational Interviewing (2nd Edition). (pp. 201-216). New York: The Guilford Press. Velasquez, M. M., Stephens, N. & Ingersoll, K. (2006). Motivational Interviewing in groups. Journal of Groups in Addiction and Recovery, 1(1), 27-50. Miller, W. R., & Moyers, T. B. (2006). Eight stages in learning motivational interviewing. Journal of Teaching in the Addictions, 5, 3-17.